Ramses II (ca. 1279-1213 B.C.) - Also known as Ramses the Great. 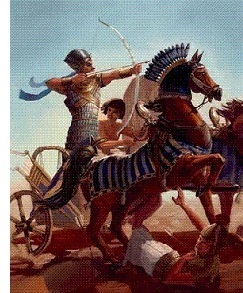 Of all the pharaoh's in Egypt's long history, Ramses II was the greatest. The length of his reign (66 years, second longest after Pepi II) combined with his achievements, puts him at the top. Ironically, he was also the last great pharaoh of Egypt. One has to wonder if his ambitious rule, over such a long span of time took such a toll on the kingdom, that it also initiated the gradual decline that followed. He proved to be both a skilled warrior and prolific builder. In addition to the many buildings and monuments he constructed, he also built an entire city; Pi-Ramses (meaning "House of Ramses"). It was built over the old Hyksos city of Avaris (on the Nile Delta) and became the new capital. This move didn't just feed Ramses' enormous ego, it served a strategic purpose as well. Under its empire, Egypt had vast holdings to the north, and moving the capital from Thebes to Pi-Ramses made it easier for the pharaoh to rule over his kingdom. Ramses was also famous for his abundant progeny. He is believed to have fathered approximately 100 children with his many wives. Of his eight known wives (and certainly several other unknown), his principal and favorite was Nefertari (not to be confused with Ahkenaten's wife Nefertiti). He was succeeded by his son, Merneptah, who was 13th in line of succession, when his twelve older brothers all predeceased Ramses. Merneptah was already 60 when he became pharaoh.